An edifice which is build based on sand as a foundation is predefined to crumpled down in a short life span, whereas the one which is build on solid rock foundation will prevail. Honorable president Issayas Aferworki invented an ethnic philosophy and induced it into TPLF with the aim to dismantle Ethiopia forever. It is true one can shape people’s mind in away one wants the people to think. Nonetheless, truth can only be buried for some time but not forever. Time has proved Prime Minister Meles Zenawi’s article 39 has been a disastrous article to Ethiopia. We knew while it was still early that article 39 was only installed to separate Eritrea from Ethiopia. Article 39 has been plugged in by Prime Minister Meles Zenawi deliberately and purposely to separate the brotherly people. The macho self-narcissism of Prime Minister Meles Zenawi did not give any opportunity to any Ethiopian to cast any opinion on the issue of Eritrea. People who opposed the move were chased from Addis Ababa University. Others were put in prison accused of war monging. Professor Asrat was the first victim. He died in prison for no good reason except for opposing the issue of Eritrea and he was still the only person who opposed the chasing of Eritreans from Ethiopia. He appealed to the government not to chase innocent Eritreans because of the conflict. At first United Nation rejected the proposal of an independent Eritrea, but honorable Prime Minister Meles Zenawi worked with Botros Botros Gali and convinced the international community. The European Community reject the proposal of an independent Eritrea by clearing stating it is against Ethiopia. The Organization of African Unity rejected and denounced the proposal of an independent Eritrea by clearly and unequivocally stating it is against Ethiopia. Prime Minister Meles Zenawi and Botros Botros Gali worked very hard and circumvented all oppositions together with the support of the American government. At that time, Ethiopians were muzzled not to say anything. Although EPRDF was not a legitimate government at the time, it legitimated itself and started working and chartering article 39 to facilitate the separation of the brotherly people. When Botros Botros Gali intended to visit Ethiopia in a bid to sensitize the separation of the two brotherly people, young and dynamic Addis Ababa University students prepared and protested against the visiting of an Ethiopian enemy honored and welcomed by Prime Minister Meles Zenawi. They were shot without any mercy. Young heroes became martyrdom of their beloved Ethiopia then. Although Many Ethiopians have forgotten them, I did not forget them. This young , 17 , 18, 20,… years old university students knew the damage which was done to their country and foresaw the imminent future security threat to their mother land. But the honorable Prime Minister Meles Zenawi’s omniscience self-narcissistic attitude never gave any opportunity to any Ethiopian to have a say on the issue of Eritrea. Then came the false referendum of Eritrean, it was a game, the decision was done long ago in the caves of Tigray and Eritrea. Even the honorable Prime Minister Melez Zenawi tacitly told to 500 Ethiopian at Mary Land University in 1989 that Eritrea will be separated from Ethiopia. Thus the referendum was a prima facie falsehood to cheat the world and Ethiopian as if we Ethiopian do not have any brain except the our honorable Prime Minister Meles Zenawi. To add insult to an injury, the referendum only had two terms, that is a choice between slavery and freedom. Where on the earth has ever been held such referendum of slavery on earth? And who on the earth will ever choose slavery? Eventually we were told Eritreans did choose to be separated from Ethiopia implicating slavery connoted living with their Ethiopian fellow and freedom connoted as independence from Ethiopia. This implicated Eritreans were not given any windows of chance to choose what they want. As stated above it was done long ago in the bushes. In the process, the honorable Prime Minister Meles Zenawi sat together in the Presence of Paul, the then secretary of state for USA, before Ms Condelezza Rice with honorable President Issayas Afeworki. They discussed about the issue of using the massawa and Assab. When honorable President Issayas Afeworki invaded Ethiopia, the then secretary of state for the United state, Mr Paul stated that both parties signed an agreement that Ethiopia will use both ports for free and when he was interviewed on radio VOA Straight to Africa he stated that since President Issayas has breached their agreement which was done in his presence, Ethiopia has a right to rescind the Eritrean independence. According Mr Paul, when President Issayas invaded Ethiopia in broad day light, the Honorable Prime Minister Meles Zenawi was supposed to rescind the Eritrean independence. However, the honorable Prime Minister Meles Zenawi did nothing to respect Ethiopia’s historical landmark claim, economic interest and security interest. Rumor had it, actually the honorable prime minister Meles Zenawi did down play about the invasion before the invasion and after the invasion. 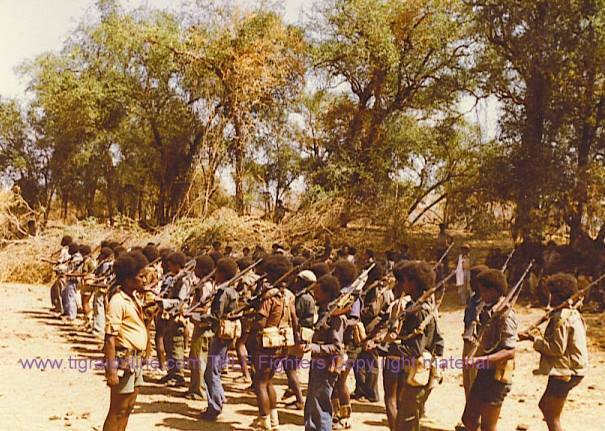 Rumor had it that even the counter offensive by Ethiopian defense forces had been prepared and launched by the then TPLF hard-cores and now dissidents like Siye and Co. Rumor had it due to the Prime Minister Meles Zenawi’s reluctance to agree with the others, he was temporarily under arrest. If that was true, history will reveal it. The war started and some estimated that 70,000 or 100,000 both sides has died during the war. No one exactly knows how many perished. At that time we all know Ethiopia was not prepared for any war due to the fact it never anticipated President Issayas could turn himself to an enemy. And it recalled its retrenched fighters and conscripted young Ethiopians who did not have any fear to sacrifice their precious lives for their beloved country. Foreign analysts paralleled the war between both side with first world war. Nonetheless, Ethiopia drove Eritreans out of Ethiopia and went deep into Eritrea and they were 100 km away from Asmara. 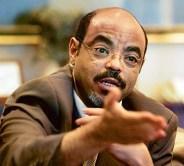 The war terminated when the honorable Prime Minister Meles Zenawi declared the end of the war. Rumor had it, the Ethiopian defense forces were forced to stop by the honorable prime minister. Rumor had it, some refused to stop without finishing the job, but they were made to stop by the decree of the prime minister. When the guys were busy on the war, prime minister was busy orchestrating an internal war within his core party. He then immediately rounded many and chased many under the cover of corruption. Then the issue of Eritrea was left smoldering for next round at some stage. Prime Minister manipulated and consolidated his power by chasing all those who do not conform to his philosophy. Since then Prime Minister Meles is working with those who say እወ to him. When Prime Minister Meles Zenawi committed and determined to separate Eritrea from Ethiopia, he told to Ethiopians we will use the ports of Assab and Massawa for free. He told to the populous let them go for the sake of peace. Ethiopians gave their historical landmark, their own brothers and sisters, their economic interest, their security interest for the sake of peace only by his direction. Now time has proved the honorable prime minister has been totally wrong. There is no peace, there is no free port. The profit of margin for Ethiopia from the prime minister is blood-bath, an enemy never imagined before, and completely landlocked country of 80 million people, an imminent and dangerous security threat for the mere existence of Ethiopia itself. Time has proved the honorable prime minister was completely wrong all the businesses he was running about Eritrea and Ethiopia. Time has proved he is still human being with all the flaws of human being. Ethiopia got neither its rights nor peace. Because of the prime minister’s single headedness, and inability to add ideas to his own, Ethiopia has been the loser because of him. Now massawa and Assab are ghost port cities. There is no any activities going on there which benefits Eritrean. In massawa they tried to run aquaculture farms, but turned upside down. Ordinary Eritreans get nothing from these ports. Ethiopia its own ports are now being used as launching pad against itself. Ethiopia is under the greatest threat now than ever in its history. There has never been any time in history massawa and Assab has been used by enemies the way now it is used. Massawa and Assab now co-ordinates Ethiopian enemies from outside and inside all along the coast. Ethiopia is insulated from all the scenes being orchestrated by the use of its own ports. Who to blame? The prime minister must bear the blame but Ethiopians bear the brunt of this wrong doing. To make it all worse, now there is another war hanging around, it can flare any time and take away the lives of many people for no good reason except for the ego-narcissistic indulgence of our prime minister. Ethiopians have been begging all along what he has done about the issue of Eritrea have been wrong. But there has never been ear to hear and listen to the grievances of the Ethiopians. All these are the fall out of a country being lead only by one man who does not corroborates with his fellow citizen or commrades. And there is no hope even he will change his shortsighted philosophy in the near future. And there are people who follow him blindly without realizing the damage to the country. They probably see it from their own sides privilege. I personally begged many times for reform but it is like pouring water on rock there is no anyone who can understand. To sum it all, Ethiopia has lost many lives in the previous war, who is responsible? Ethiopia lost properties who is responsible? Ethiopia has spend approximately $5 billion dollars to cater the defenses forces facing Eritrea since 1998, who is responsible? If this money could have been used to build hospitals, how many hospitals could have been built? How many Universities could have been built? What infrastructures could have been built? How is development possible without peace and without respect and securing once our rights and interests? We all know and the whole world know that president Issayas started the previous war, but there are Eritreans who still believe he did not. How is it possible to have peace when the other party is hell bent to create havoc, war, … against his own people? How is it possible to have peace when one is obsessed with hatred and fabricating false and non-existence false history? I love the Eritrean people since they are my people. I am afraid their attitude does not seem to reconcile, probably not all of them. But when I go to paltalk to listen what they say, all what they know is slurry and insult, and so forth. They never acknowledge any truth except indulging in a non-existence unicorn identity. The fact that about 170,000 Eritreans live in refugee camps in Sudan since 1967 does not allow me to sleep. These people are suffering for half century because of the figment of few people who indulge in an Eritrean identity. They even try to tell us they are different race and different human being on the earth. How is it possible to bring peace with people who are hell bent to deny themselves their own whoness? Peace and love are reciprocal, Ethiopia cannot afford to go on bleeding because of its own sons and daughters fault. Something has to be done that reciprocates their actions to balance and bring a lasting peace. Ethiopia is the only country which practices Jesus Christs Command,” when your enemies slap one of your face, turn and give them your other face” this is what Ethiopia is doing under Prime Minister Meles Zenawi. Honorable Prime Minister Meles Zenawi, if two people have to make peace they must respect each other otherwise they cannot coexist or work or live together and that is why you chased your comrades because they did not accept your ideas only. As such the lasting peace between Eritrean and Ethiopian can only come when the rights of both people is protected in a balanced way. You cannot bring peace by oppressing, denying the right of one party and favoring the other party. Many Ethiopians accuse the honorable president Issayas Afeworki, but the truth is we must not see the behavior of the president only. We must do cause and effect analysis. If we see only the effects, we will tend to accuse and lay all the blame on the president whom you first recognized. However, we need to see the cause too. The cause of the problem is not only Issayas but also you yourself. If we take stock of all the business you have done with him, both of you are the main actors of the problem. We were told you were both progressive, but turned regressive. In conclusion, there can never be lasting peace at the expense of only one party all the time. Ethiopia has done its part for the sake of peace as you stated it before you became even a legitimate government. Ethiopia had enough, enough is enough, you must take the bitter pill and change your old-colonial fashion philosophy and undo your wrong doings. If you cannot, give others to do the job for their country. Our people, both Ethiopian and Eritrean cannot afford to go on bleeding forever because of the colonial political philosophy of both leaders. In order to go forward all of us, you need to undo what you have done a more or less a two decade ago. Although I believe you are human and can make mistakes, it is unfair for us to follow you blindly and our country is being haunted everyday by the events and actions you have done two decade ago. It is unfair both brotherly people die, suffer, weep,… for nothing. This must come to a closure. The journey of bloodshed, conflict, living in refuge camps, hate, famine, war, disease, ignorance, arrogance, … must come to an end.